My husband and I have a lot in common, in spite of being opposites, if that makes sense. We’re both homebodies, yet we also love to travel. And we both love Indian food. Actually these might be the only things we have in common. But they’re important things! For a small celebration at my house recently, I decided to make an Indian spread. I planned it like a buffet you’d experience at a good Indian restaurant. You’ve never heard these words come out of my mouth before, but at Indian restaurants, I’m not at all opposed to eating from the buffet. I think it must be difficult for Indian restaurants to make bad food, even for their lunch buffets, because I’ve never had any. (Unlike the case with Chinese buffets, for example.) There’s never been a curried protein, vegetable, or bean dish that I haven’t enjoyed. And if their naan is good, then I’m in heaven. One of my husband’s favorite dishes on a typical Indian buffet is sag paneer or mattar paneer – curried spinach or peas with paneer. 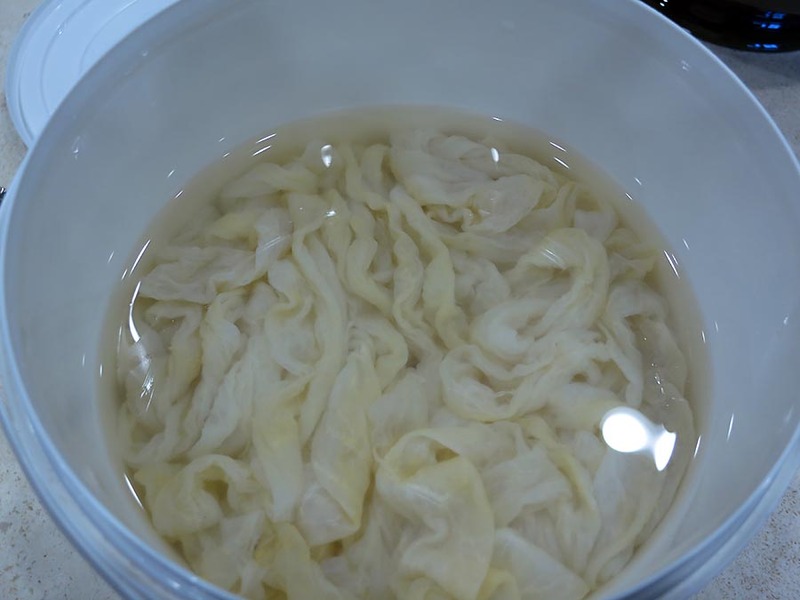 Traditional aneer, which is easy to make from scratch, is similar tofarmers’ cheese. It add something texturally but not really flavor-wise to me, so I can take it or leave it. Many years ago I came across a dish simply called sag – fried spinach and broccoli – no paneer. The recipe is in one of my favorite cookbook series – Foods of the World by Time Life. It’s a lovely vegetable dish, and a wonderful accompaniment to chicken curry, lamb korma, or any vegetarian curry dish. Following is the recipe exactly from the cookbook. Combine 1/2 cup of the water and a handful of the spinach in the jar of an electric blender, and blend at high speed for 30 seconds, or until the mixture is reduced to a smooth purée. 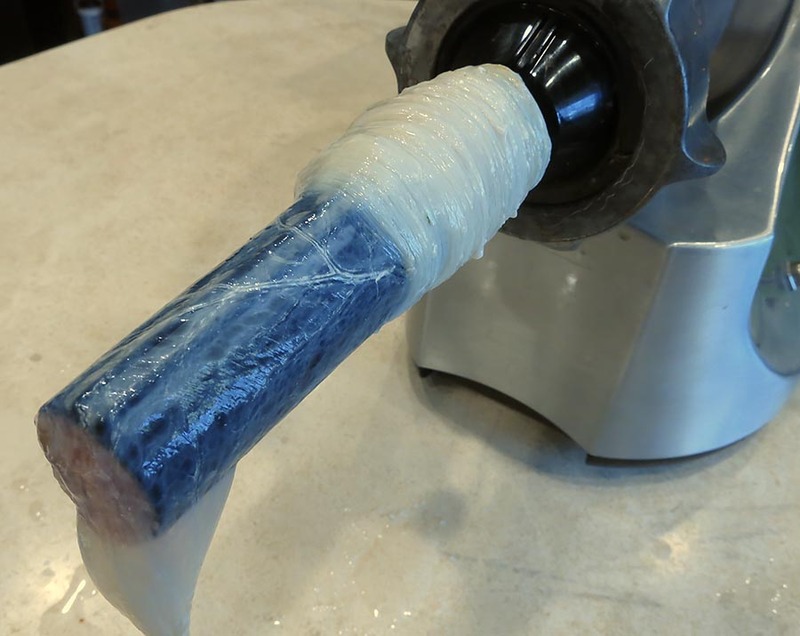 Turn the machine off and scrape down the sides of the jar with a rubber spatula. Then add another handful of spinach, purée for 30 seconds and stop the machine again. Repeat until all the spinach has been puréed. Transfer the spinach to a bowl, and pour the remaining 1/2 cup of water into the blender jar. Purée the broccoli a handful at a time as you did the spinach, then stir the puréed broccoli into the spinach. In a 10″ karhai or heavy skillet or a 12″ wok heat the ghee over moderate heat until a drop of cold water flicked into it sputters instantly. This is a photo of an Indian karhai, also spelled karahi. I used my large wok. Add the ginger and fry for 1 minute. 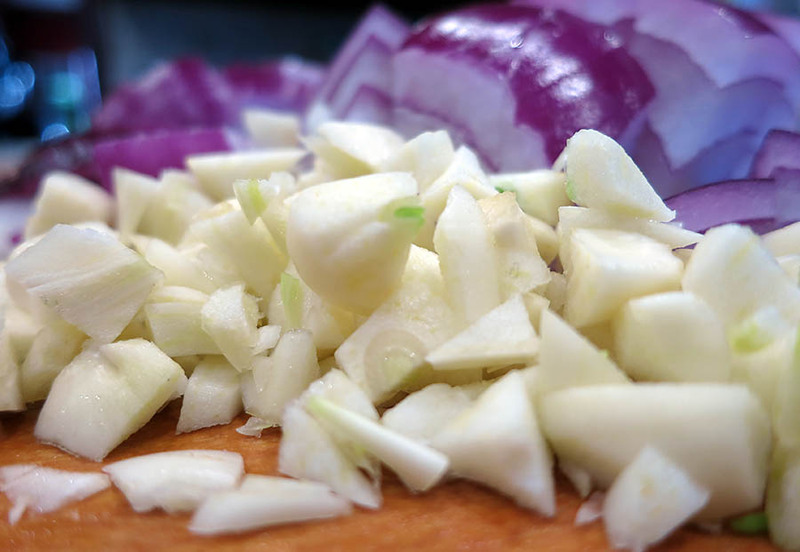 Add the onions and salt and continue to fry, lifting and turning the mixture constantly, for 7 to 8 minutes, or until the onions are soft and golden brown. Stirring after each addition, add the cumin, turmeric, coriander and garam masala. Fry for 1 to 2 minutes, until the ingredients are well combined, then stir in the spinach and broccoli a cup or so at a time and fry for 5 minutes more. Reduce the heat to the lowest possible point and, stirring occasionally, simmer uncovered for 15 minutes, until almost all of the liquid has evaporated and the mixture leaves the sides of the pan in a solid mass. Serve at once from a heated bowl or platter. I added a little flaked salt to my sag. In the Punjab, where it originates, sag is usually made with fresh mustard greens; you may substitute these for the spinach and broccoli if you like. As much as I love Indian meat and seafood dishes, I also really love dal – the various legumes of India. So today I served myself sag along with curried chick peas. A delicious and satisfying meal! *Ghee is simply clarified butter. Sometimes I use it, sometimes I don’t. The clarifying of the butter removes the solids which can brown and also burn, but it’s the solids to me that provides such lovely flavor. If you’re not using extremely high heat and can’t get your hands of ghee, regular butter will work fine. Note: If you want to add paneer to this dish but don’t want to make it from scratch, use firm or extra-firm tofu – the kind in water, not the silken variety. If any of you has noticed, I’ve been into a bit of name-calling lately. 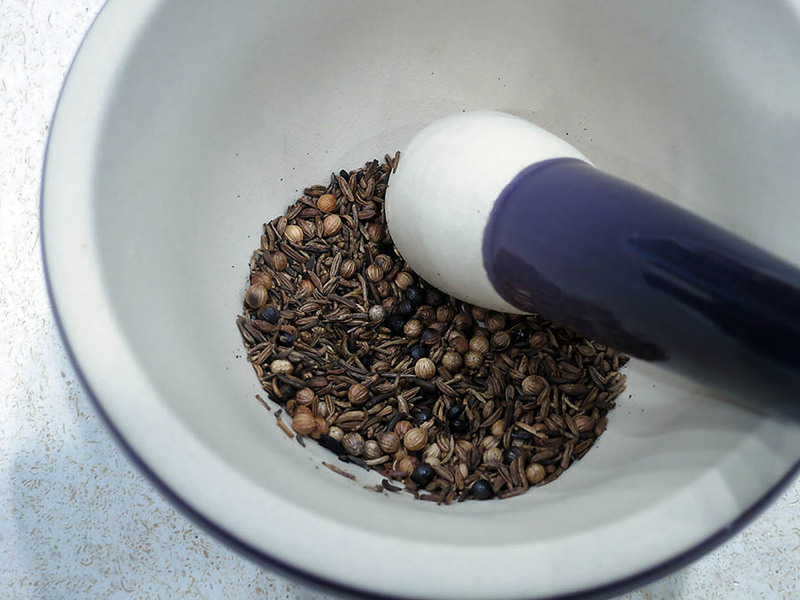 Namely, sauces, or condiments, from chimichurri, to tapenade, to romesco to charmoula. To me, condiments make the world go ’round, and my life of eating revolves around them. I love them all. Today I’m making harissa. It’s flavorful and versatile, and just like other global sauces and condiments, it’s easy to make. Furthermore, when made from scratch, it’s far superior in flavor. I actually think harissa might be my all-time favorite sauce. The base is roasted red bell peppers, so like its “cousin” romesco, it’s fabulous slathered on meats and breads with cheeses. But harissa is also spicy, which puts it over the top for me. 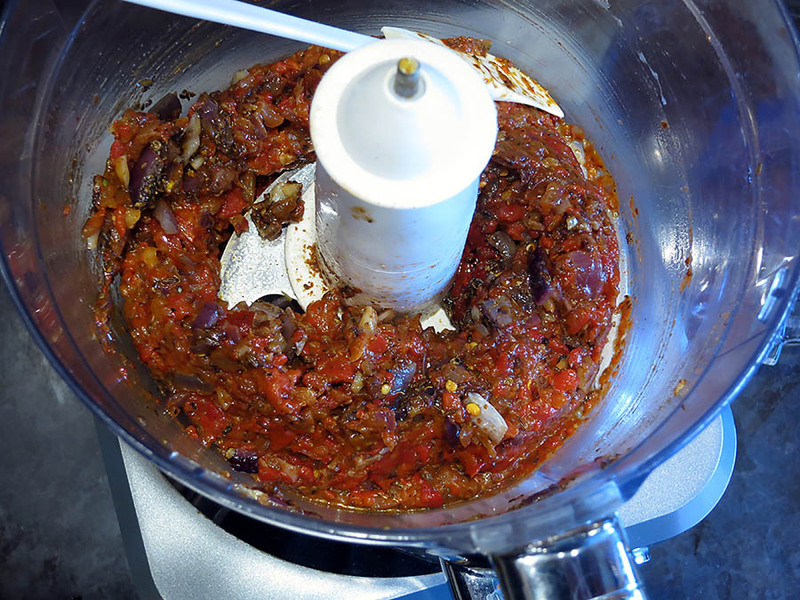 The sauce originates from North Africa, which is probably why there are so many similarities between it and romesco. I’m not a food historian, but I know that the southern tip of Spain almost touches the northern tip of Africa. So I’m sure there’s been all kinds of sharing of ingredients and spices over the centuries of food trading. Tunisia is actually the country with which harissa is most commonly associated. 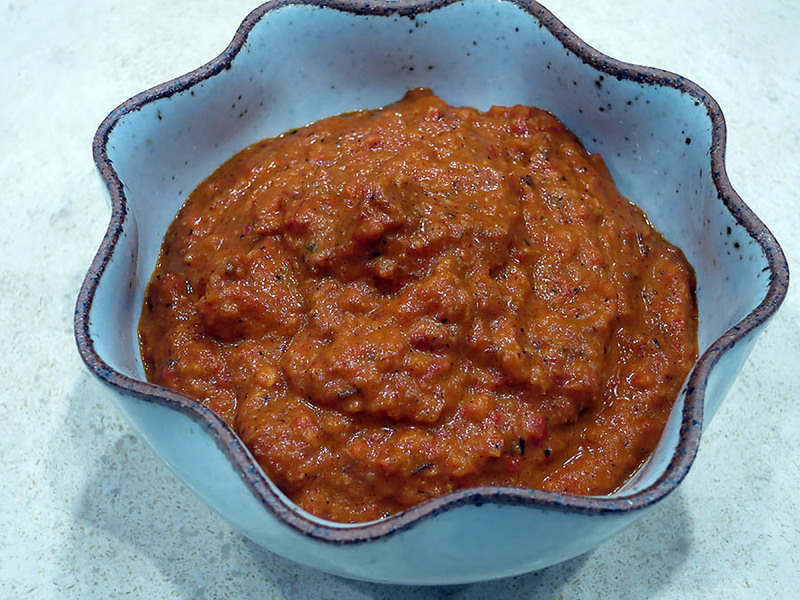 When I decided to make harissa from scratch, I found so many variations, not surprisingly, that I just came up with my own recipe, and this is what I’m posting today. I can’t possibly test out and taste all of the versions, but I can tell you that my adaptation is near perfection. What is exciting is all of the potential uses for this sauce. Today I made up a little cumin-spiced lamb burger and used the harissa with mayonnaise for a lovely spicy condiment. But of course it can be used as is as well, on meats of any kind. Harissa can also be added to vegetables, stews and soups, risottos, and so many more dishes. 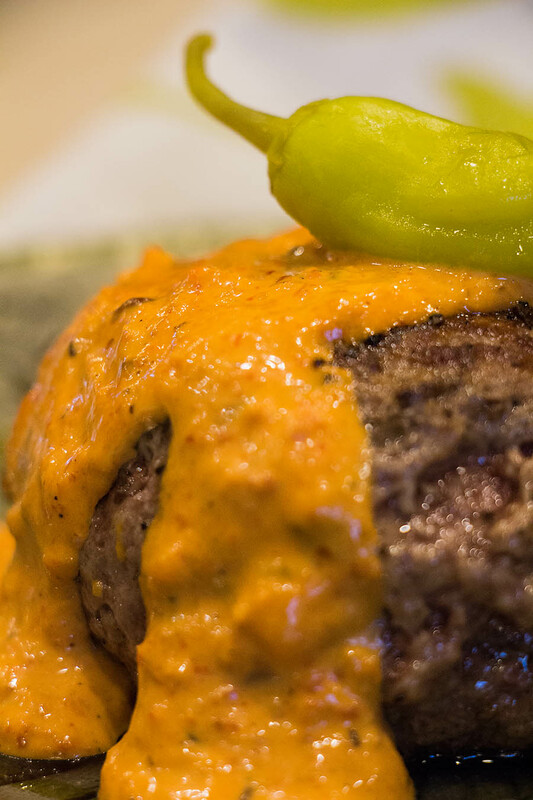 As long as the harissa shines. You want to taste this stuff because it’s that good. First drain the red bell peppers well in a small colander. Next, place the seeds in a small seed toaster. Let them cool for a second, then place them in a small mortar. Grind them and set aside. Heat some of the 1/4 cup of olive oil in a large skillet over medium-high heat. Have your onions and garlic ready to cook. 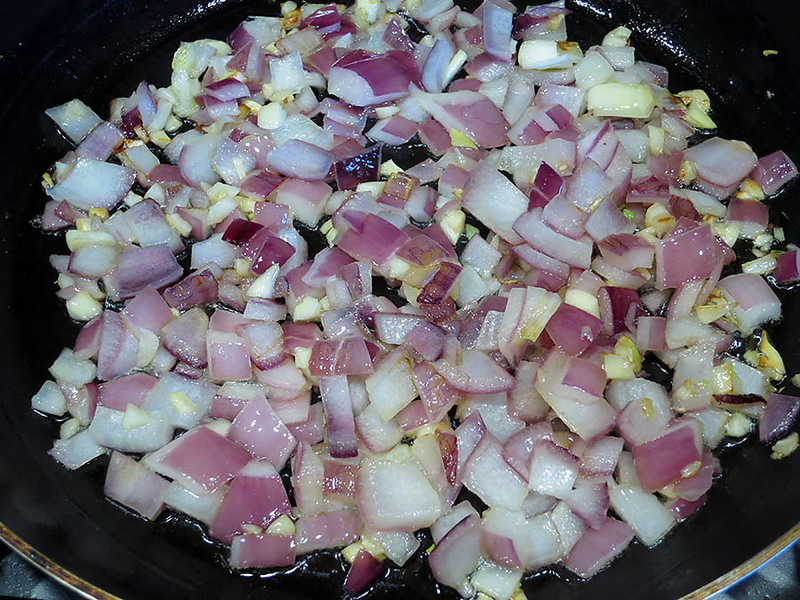 Saute them for about 6-7 minutes; you want some caramelization on them. Set the skillet aside and let the onions and garlic cool slightly. 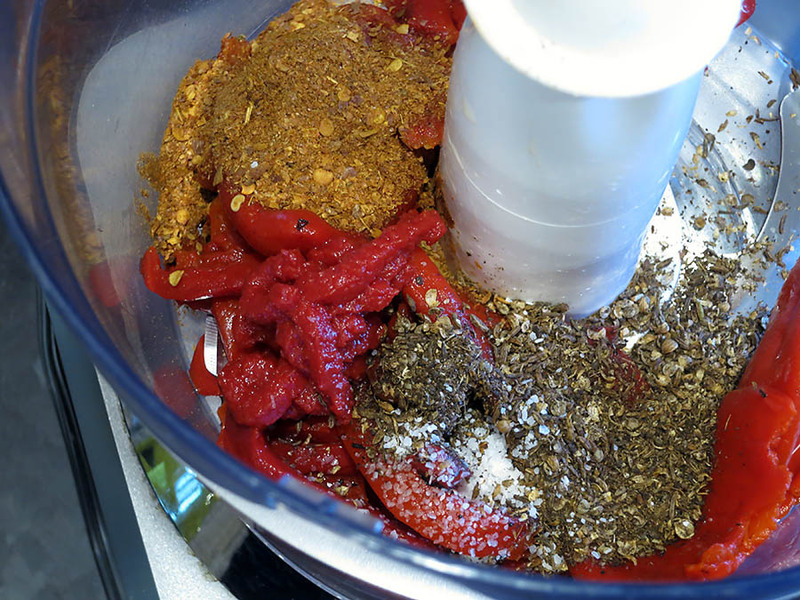 Meanwhile, place the well-drained roasted red bell peppers in a jar of a food processor. Add the ground seasoning mix, the tomato paste, the crushed red pepper, and about 1/2 teaspoon of salt. Then add the cooled onion and garlic. Add the remaining olive oil and begin processing. After a little bit, you will need to scrape down the sides of the jar and process further. Process for about another minute. The mixture will be smooth, but still have a little texture to it. 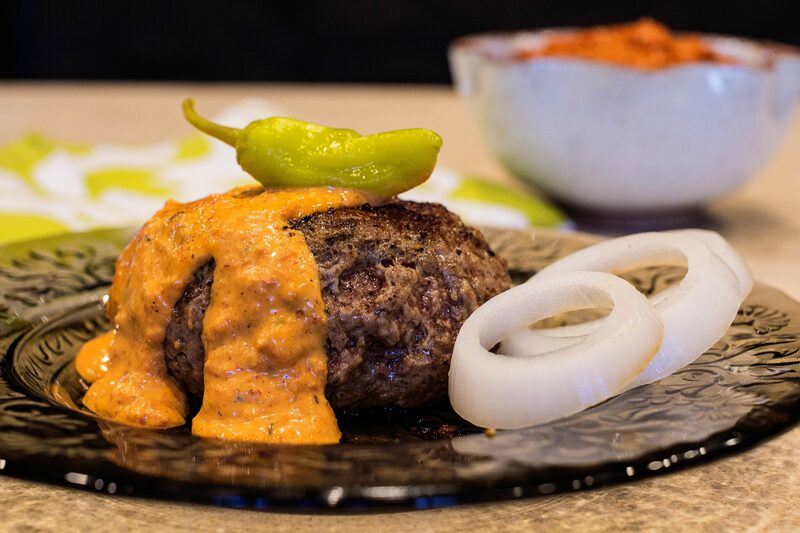 As I mentioned above, I wanted to make a mayonnaise with the harissa today, to complement a lamb burger I was craving. 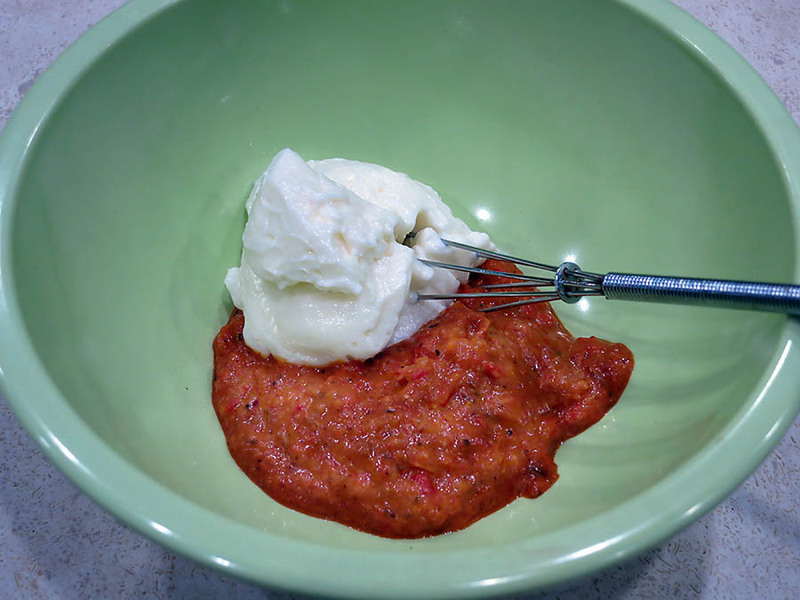 So I simply mixed 1/2 harissa and 1/2 mayo together in a little bowl. 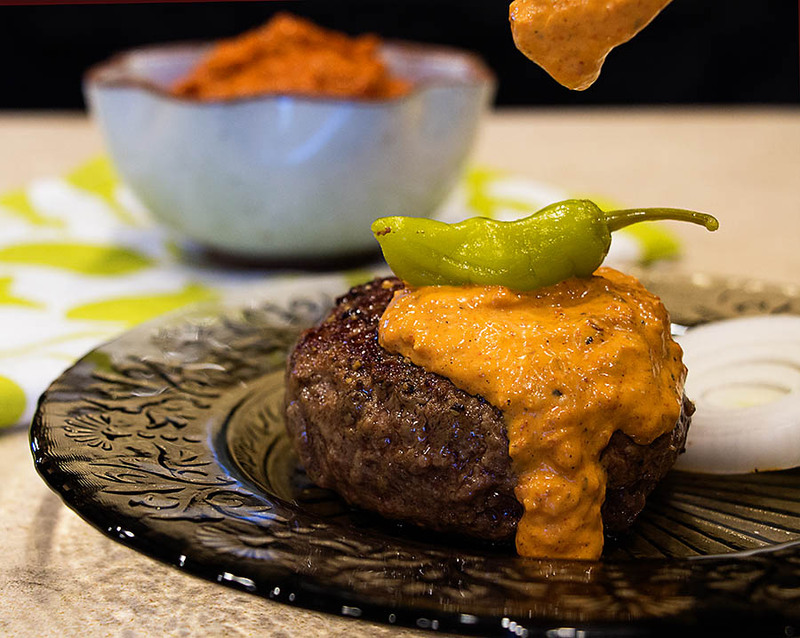 Simply whisk the mayo and harissa together. I served it at room temperature with my lamb burger. 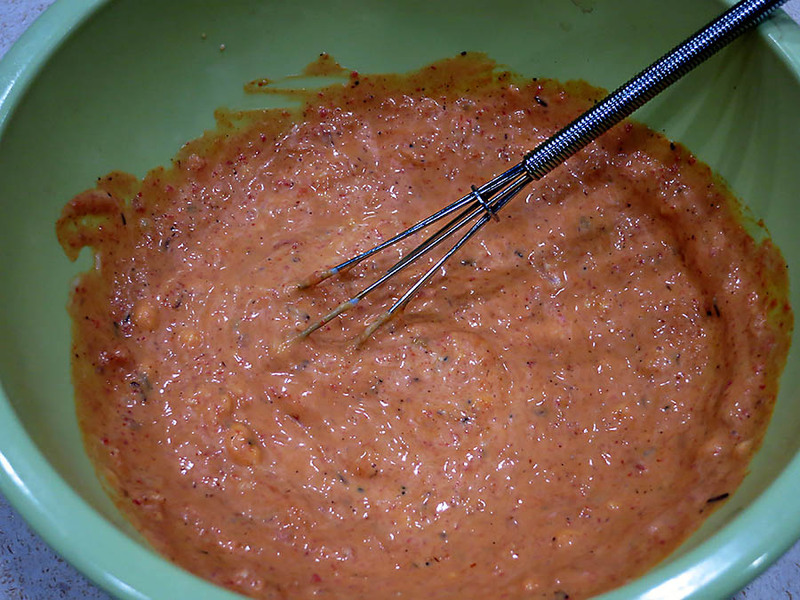 When I mixed together the harissa and mayonnaise, the beautiful red color disappeared. 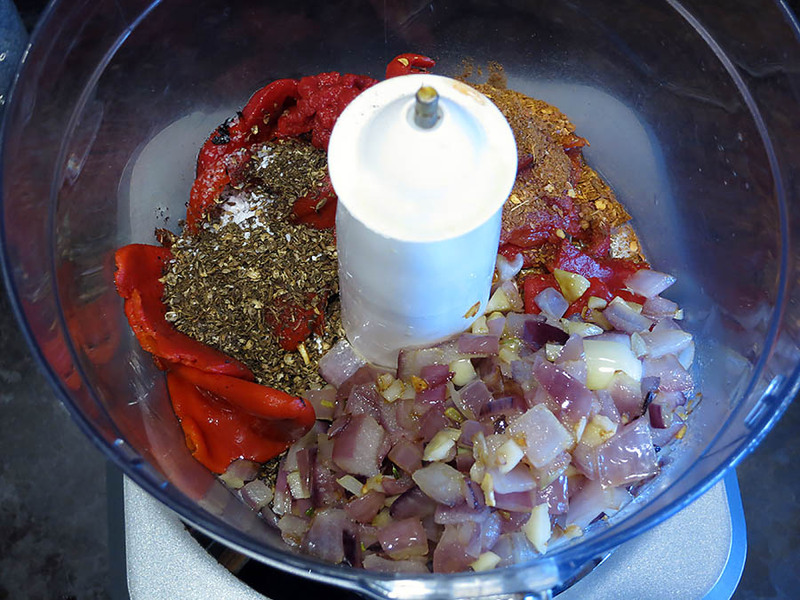 But what doesn’t go away is the fabulous harissa flavor profile – roasted red bell peppers, the lovely seasonings, onion, garlic, and crushed red pepper. 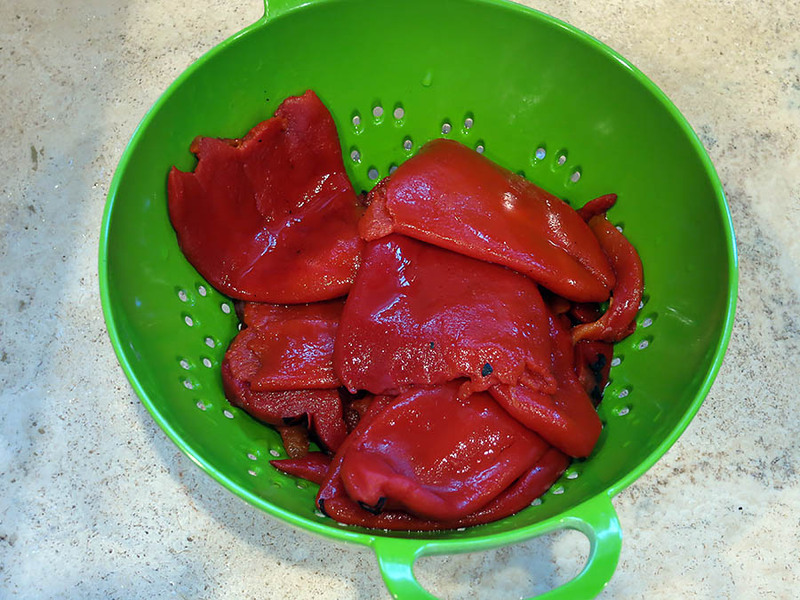 * You could also roast your own red bell peppers and peel off the skin, but I truly love the soft texture of jarred roasted red bell peppers. It’s your choice. To be honest, I’ve only made real sausages from scratch one time before. They came out so fabulously that I’ve been wanting to recreate them for years. I don’t know what stopped me, or at least, made me procrastinate. Somehow in the back of my mind I must have thought it was so taxing, that I dreaded the thought of doing it again. Sort of like childbirth. But alas, I did it again, and I don’t know what all my fuss was about. It’s truly easy to make sausages. It does take a little time. But with proper footwear and favorite music on the IPOD, it makes for a fun afternoon. And what you get for all of your hard work? Sausages! Delicious, flavorful sausages with no preservatives or any of that other terrible stuff that’s probably in store-bought sausages. The first thing you need is an electric meat grinder. Mine looks very much like this although it is an ancient model. 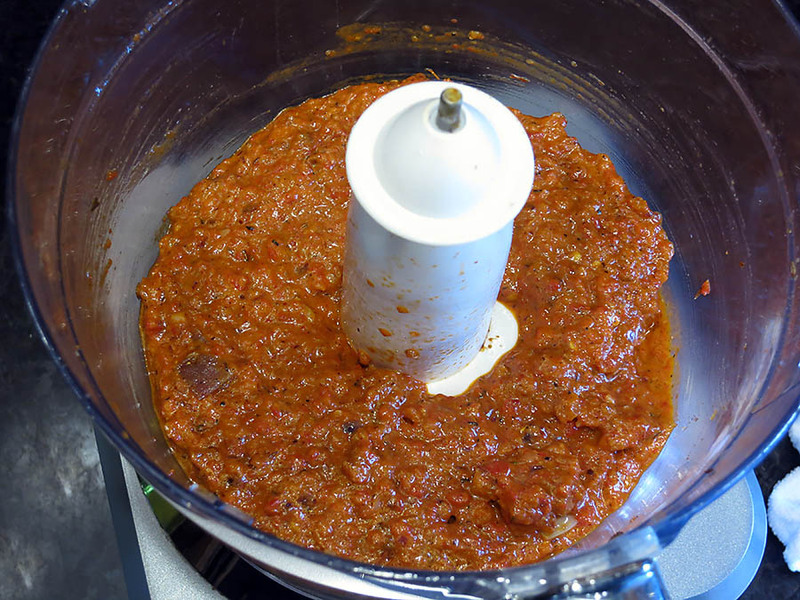 A meat grinder is a very useful tool in the kitchen, especially if you like making terrines. 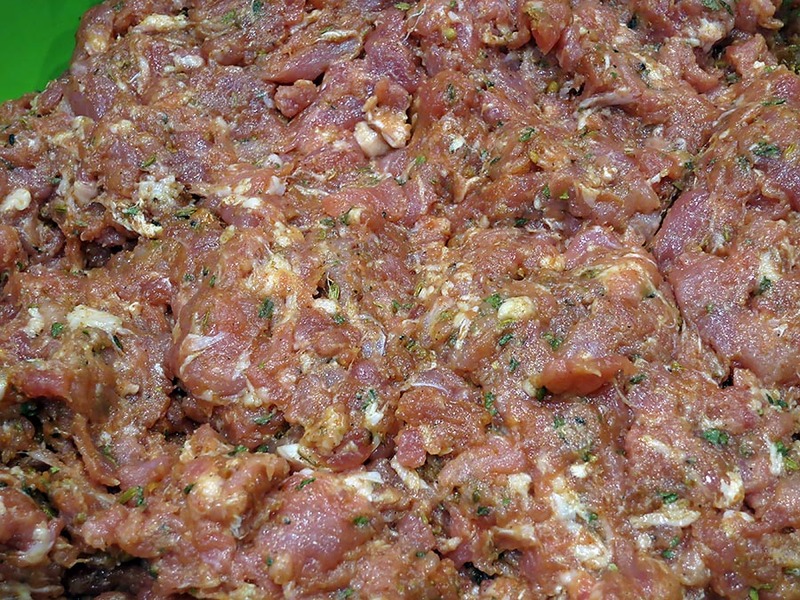 I’ve also ground up brisket meat for fresh hamburgers, which has a perfect fat-to-meat ratio. 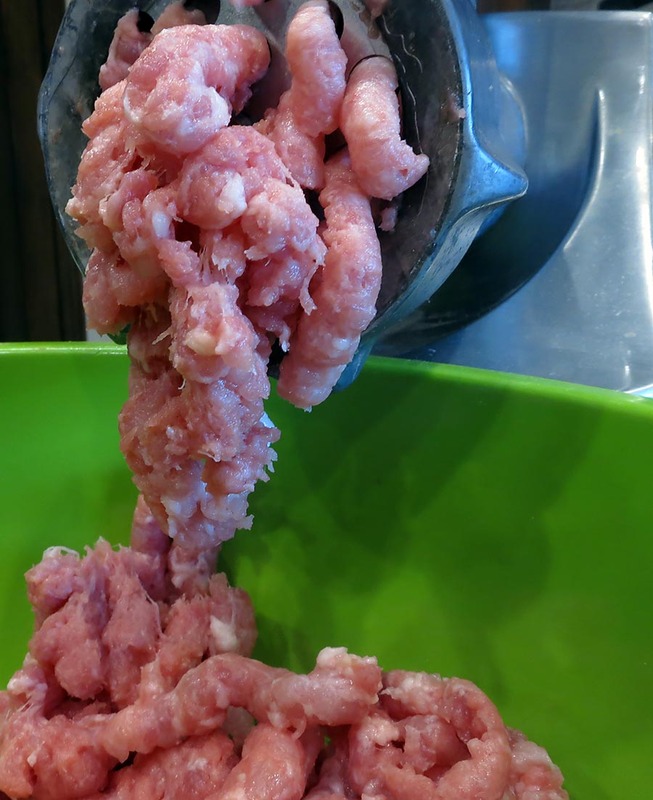 Really, if you have any desire to cook with ground meat, like make meatballs, for example, it’s just so straight forward to use the meat grinder and grind up your own meat. That way, you can mix it up – chicken, and pork, for example. And this way, you’re not paying someone else to do the grinding for you. The machine is quite noisy, which is my only complaint. The meat grinder comes with two different sized attachments for making sausages. It had been so long since I’d made sausages that I almost didn’t find them in my kitchen… but I did. Phew! 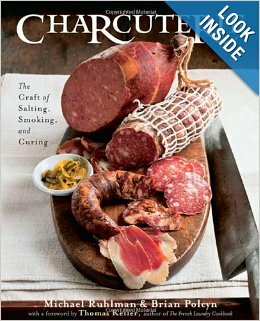 For the sausage today I’m using a popular book as a reference for an Italian sausage recipe – Charcuterie, by Michael Ruhlman. For my first sausage-making experience I used a book called Home Sausage Making, but I think the book is trapped in the bookshelf behind our live Christmas tree. It’s been too cold to plant the thing outside, but hopefully it will be gone soon and I can reclaim some of my cookbooks! note: The Christmas tree is gone. This post was written in the early part of January! 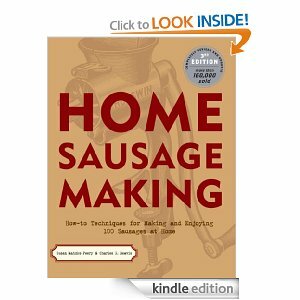 The book is a very good primer on how to make sausages, including all of the necessary ingredients, the casings, storing, cooking, and so forth. I highly recommend it if you want to make sausage for the very first time. 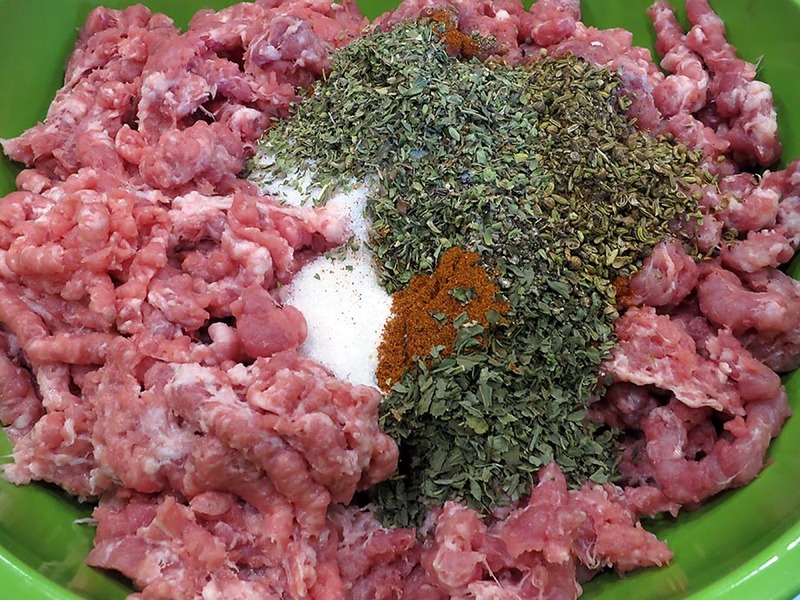 To begin, grind all of the meat, about 5 pounds, plus any fat attached, using the largest holed grinder plate. 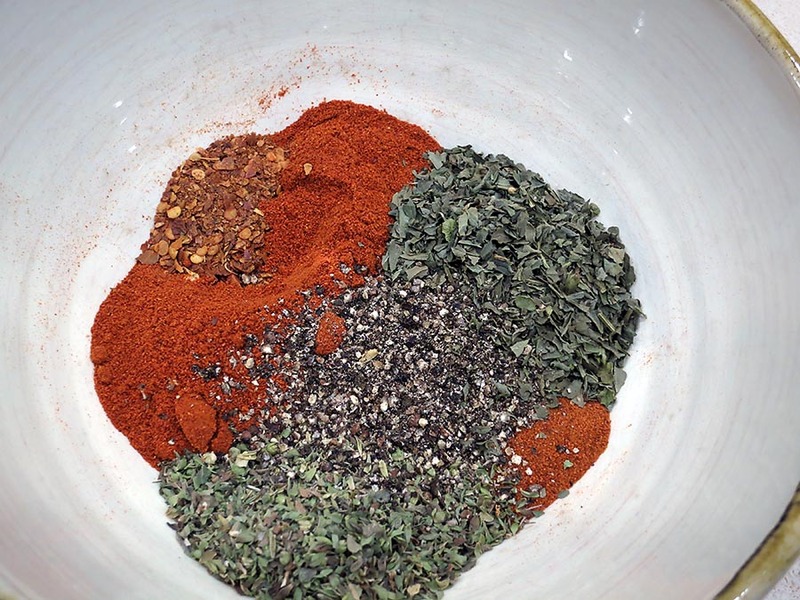 Place all of the seasoning ingredients in a large bowl, then give them a stir. Then add them to the ground pork. Using gloved hands, if desired, stir the pork together well, mixing in the spices and herbs until they’re evenly distributed. Then add the chilled water and vinegar and mix well. Set aside the ground sausage mixture. The next step is to prepare the casings. I’ve owned this container of casings since the last time I made sausages, which is maybe 8 or 9 years back. They keep well refrigerated, but before you use them they need to be rinsed well because of the brine in which they’re stored. 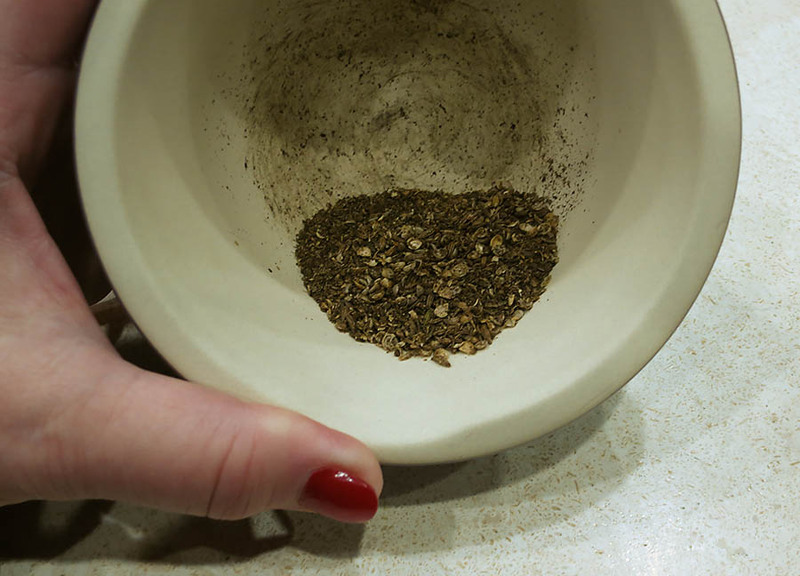 Place a good handful of the casings in a large bowl. You probably have pulled out too many lengths, like I did, but they’re just no way to judge. Better to have too many than not enough and have to do over this step. 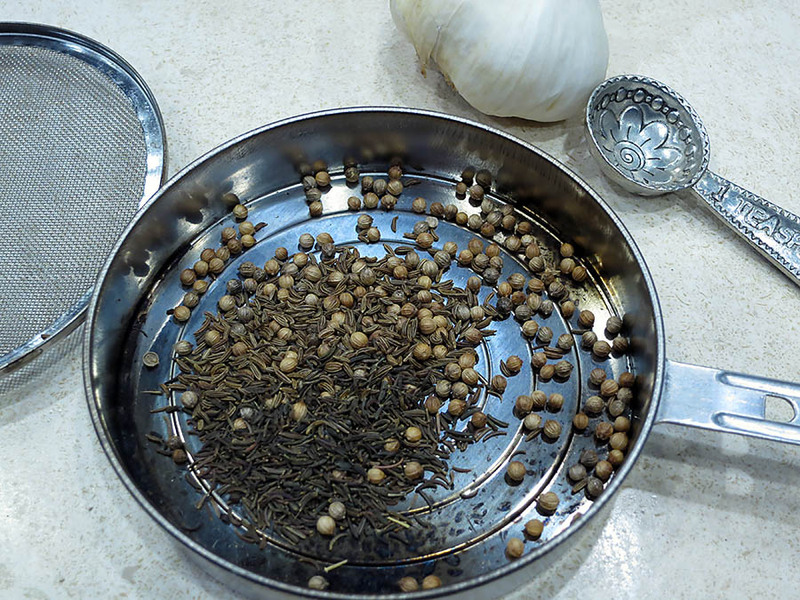 Once the casings are in the bowl, give them many rinses of cold water. One note: they stink. I think it’s mostly because we’re dealing with intestinal linings here. The smell is expectedly not pleasant. It does, however, get more pleasant after they’re rinsed. So don’t be discouraged. Then, it’s important to open up the casings and rinse out the insides as well. I couldn’t get a photo, with only two hands, but you can see the casing that I’ve filled with water in the bowl. Repeat as many times as you find casing lengths to make sure they’re all rinsed out. 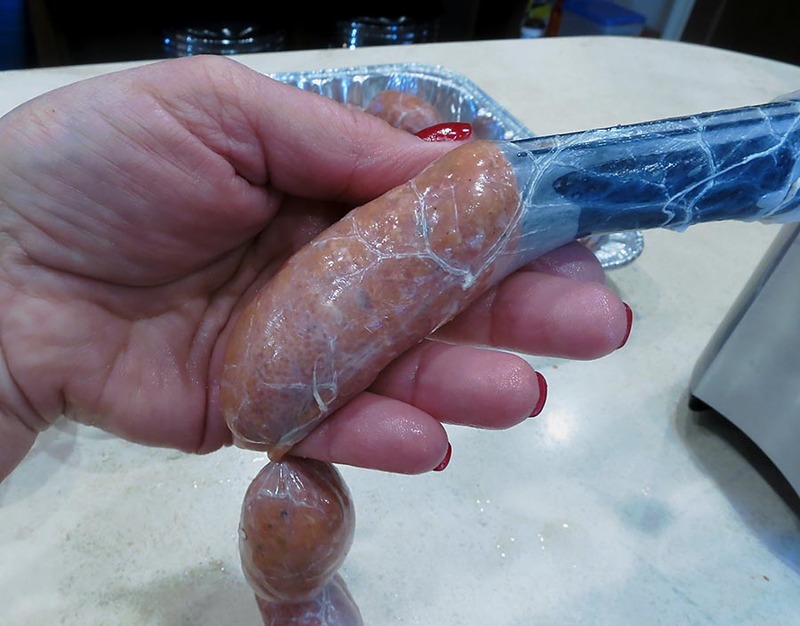 So now you have your sausage meat ready to go, as well as the casings. Clean up the meat grinder and the work area. 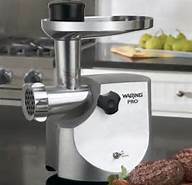 All you need to do is install the medium-holed grinder blade and the sausage attachment to the meat grinder. For the Italian sausages, I’m using the sausage filler with a 3/4″ opening. Then grab a length of casing (you can shorten them as you like) and place it on the sausage filler attachment. 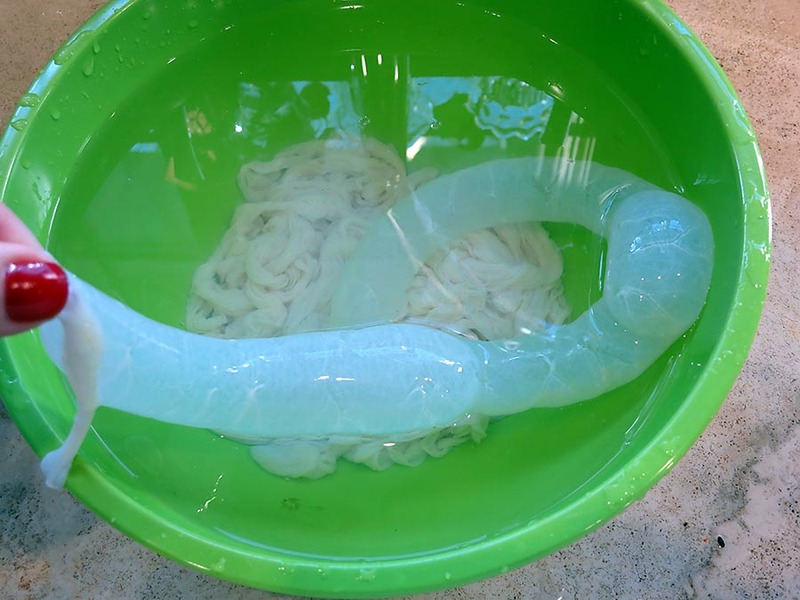 Yes, we all know what this looks like. 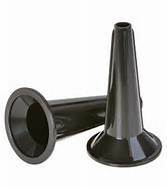 Tie an end at the casing, just like you would a balloon. Then turn on the loud machine and begin adding the sausage. Fortunately, it’s pretty easy to control the speed of the sausage coming through the machine, so one person can do this job easily. 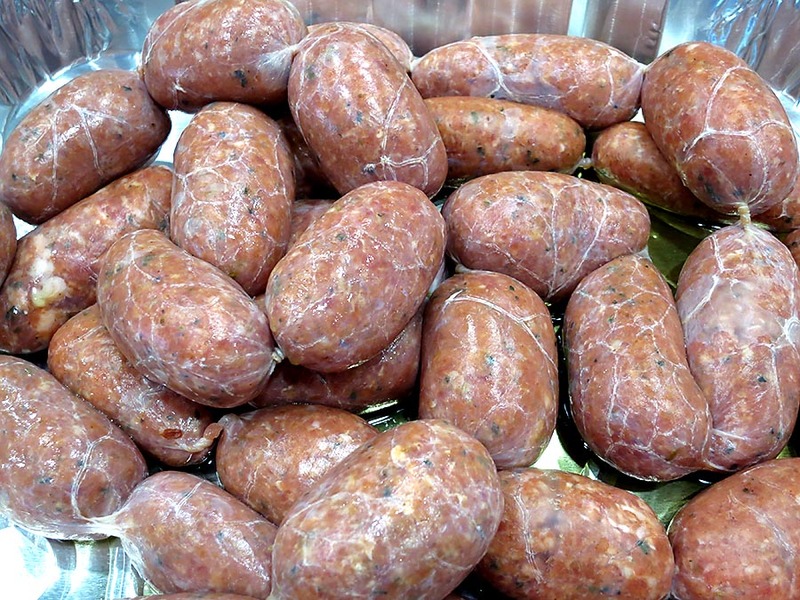 Allow the casing to fill with the sausage, but not overfill, for fear of the casing splitting open. This has actually never happened to me; they seem pretty sturdy. 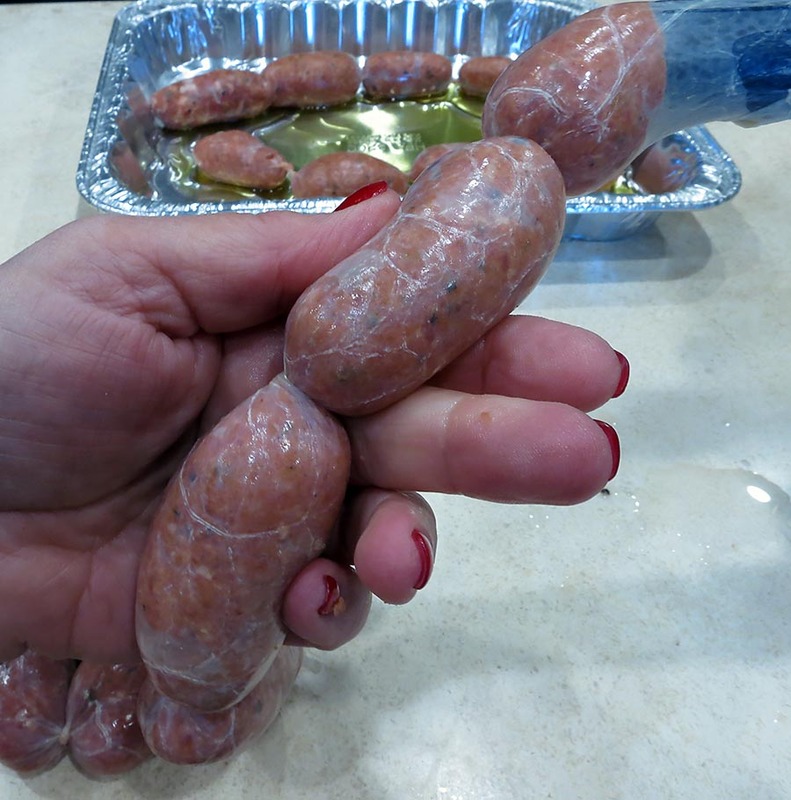 Allow the sausage to fill the casing, and when they’re about the right length, give the sausage a twist, and repeat. Today my sausages were turning out a bit on the squatty side, but it really doesn’t matter. It does help that they’re even-sized for cooking purposes, but that takes a bit more practice I’m afraid. I shouldn’t wait another 8 years to make sausage again! 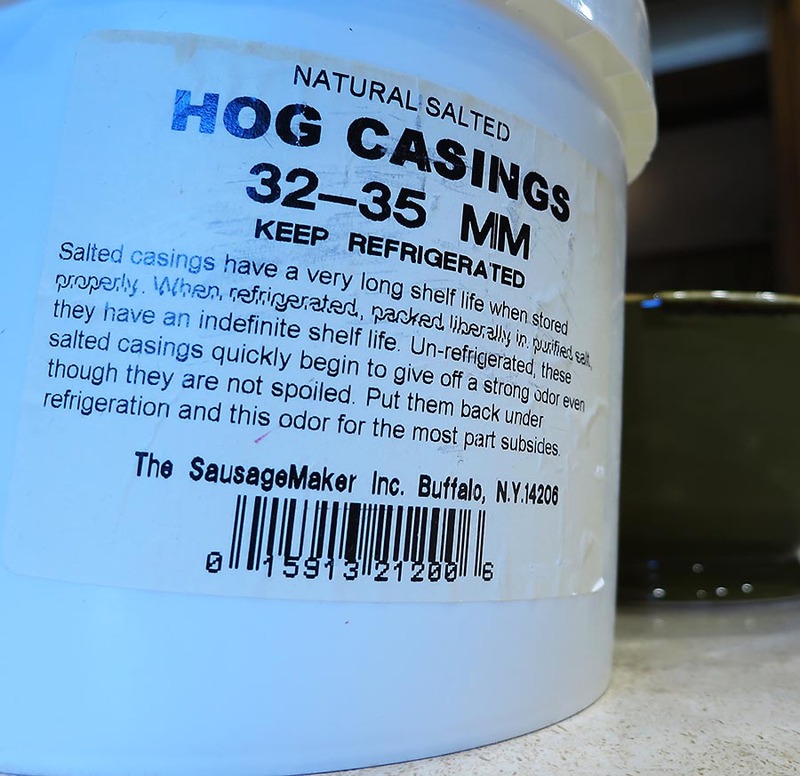 When you’re done with a length of casing, add a new casing, and make more sausages. Continue with the remaining sausage meat. I placed my lengths of sausage in a pan with a little oil drizzled on the bottom. I plan on saving half of the batch to use immediately, and freezing the second half. For any of you interested, we enjoyed the Italian sausages as is, once served with lentils, another time served alongside pasta with pesto. 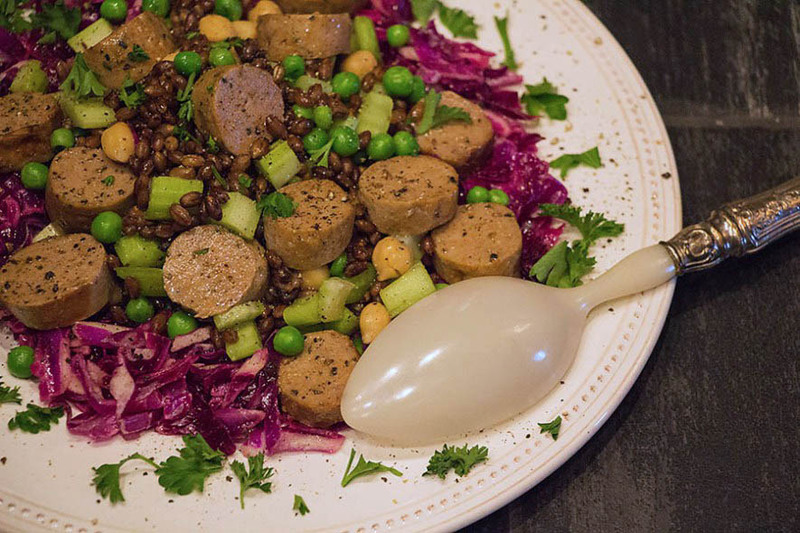 For lunch one day I cooked up some black barley, added some cabbage, peas, chickpeas, and celery, tossed everything with olive oil and lemon juice, added sliced Italian sausage that was left over, and enjoyed a fabulous meal, shown in the photos. note: Fat is typically added to sausages when you make them from scratch. I can’t bring myself to do this. The original Michael Ruhlman recipe included fat, but I ignored it. However, what it does mean is that you absolutely cannot overcook the sausages or they will be dry. The fattiness keeps them nice and moist. And honesty, the fattier, the better. But for me, making them at home, I just can’t bring myself to add fat. To cook the sausages, I used a decent amount of oil in a skillet, browned them, lowered the heat, put on a lid, and cooked them through for about 5 minutes. And they were done. And moist. Alternatively, add fat to the pork, and no matter what you do to the little buggers, they will remain moist.